While versions of Tetris were sold for a range of 1980s home computer platforms as well as the arcades, it was the hugely successful handheld version for the Game Boy launched in 1989 that established the game as one of the most popular ever. Electronic Gaming Monthly's 100th issue had Tetris in first place as "Greatest Game of All Time". In 2007, Tetris came in second place in IGN's "100 Greatest Video Games of All Time". In January 2010, it was announced that Tetris had sold more than 170 million copies, approximately 70 million physical copies and over 100 million copies for cell phones, making it the highest paid-downloaded game of all time. On 14 March 2014, the Tetris Company announced a deal to bring Tetris to the latest hardware platforms, Xbox ONE and Playstation 4, in partnership with Ubisoft (Publishing) and SoMa Play (Development), to coincide with the Franchises' 30th Anniversary. Tetriminos are game pieces shaped like tetrominoes, geometric shapes composed of four square blocks each. A random sequence of Tetriminos fall down the playing field (a rectangular vertical shaft, called the "well" or "matrix"). The objective of the game is to manipulate these Tetriminos, by moving each one sideways and rotating it by 90 degree units, with the aim of creating a horizontal line of ten blocks without gaps. When such a line is created, it disappears, and any block above the deleted line will fall. When a certain number of lines are cleared, the game enters a new level. As the game progresses, each level causes the Tetriminos to fall faster, and the game ends when the stack of Tetriminos reaches the top of the playing field and no new Tetriminos are able to enter. Some games also end after a finite number of levels or lines. Pajitnov's original version for the Elektronika 60 computer used green brackets to represent blocks. Versions of Tetris on the original Game Boy/Game Boy Color and on most dedicated handheld games use monochrome or grayscale graphics, but most popular versions use a separate color for each distinct shape. Prior to The Tetris Company's standardization in the early 2000s (decade), those colors varied widely from implementation to implementation. Nearly all Tetris games allow the player to press a button to increase the speed of the current piece's descent, rather than waiting for it to fall. If the player can stop the increased speed before the piece reaches the floor by letting go of the button, this is a "soft drop"; otherwise, it is a "hard drop" (some games allow only soft drop or only hard drop; others have separate buttons). Many games award a number of points based on the height that the piece fell before locking. Traditional versions of Tetris move the stacks of blocks down by a distance exactly equal to the height of the cleared rows below them. Contrary to the laws of gravity, blocks may be left floating above gaps. Implementing a different algorithm that uses a flood fill to segment the playfield into connected regions will make each region fall individually, in parallel, until it touches the region at the bottom of the playfield. This opens up additional "chain-reaction" tactics involving blocks cascading to fill additional lines, which may be awarded as more valuable clears. Tetris was created in June 1984 by Alexey Pajitnov, an artificial intelligence researcher working for the Soviet Academy of Sciences at their Computer Center in Moscow. Tasked with testing the capabilities of new hardware, Pajitnov would do so by writing simple games for them. He initially considered creating a game around pentominoes which featured in puzzle games that he had enjoyed as a child, but felt that it might have been too complicated with twelve different shape variations so switched to tetrominoes, of which there are only seven variants. The Elektronika 60 on which he was working had only a text based display so the tetrominoes were formed of letter characters. Realising that completed lines resulted in the screen filling up quickly, Pajitnov decided to delete them, creating a key part of Tetris gameplay. Pajitnov’s game proved popular with his colleagues. Academy of Sciences co-workers Dmitry Pavlovsky and Vadim Gerasimov ported the game to the IBM PC. Gerasimov reports that Pajitnov chose the name "Tetris" as "a combination of 'tetromino' and 'tennis'." From there, the PC game exploded into popularity, and began spreading all around Moscow (the most recent version of this port is available on Gerasimov's web site). Meanwhile, before any legal rights were settled, the Spectrum HoloByte IBM PC version of Tetris which contained background graphics featuring Russian scenes was released in the United States in 1987. The game's popularity was tremendous; Computer Gaming World called the game "deceptively simple and insidiously addictive". For Amiga and Atari ST two different versions by Mirrorsoft (1987) and Spectrum Holobyte (1988) became available. The Mirrorsoft version did not feature any background graphics while the Spectrum Holobyte's version was similar to their PC version and contained the similar images (it was also distributed by Infogrames in some regions). The games were sold as budget titles due to the game's simplicity. Spectrum's Apple II package actually contained three diskettes with three different versions of the game, for the Apple II+ and Apple IIe on separate DOS 3.3 and ProDOS 5.25 in (133 mm) diskettes, and for the Apple IIgs on a 3.5 in (89 mm) diskette, none of which was copy-protected: the included documentation specifically charged the purchaser on his or her honor to not give away or copy the extra diskettes. Unsure of how to publish his game and fearful of the response of the Soviet regime if he did so, Pajitnov took the opportunity offered by Perestroika and gave the rights to the Soviet government for ten years. In 1988, the Soviet government began to market the rights to Tetris, following a promotional trip to the country by Gerald Hicks, the one-time United States champion of the game, through an organization called Elektronorgtechnica, or "Elorg" for short. At this time, Elorg had still not been paid by Andromeda, but Andromeda was licensing and sub-licensing the rights to the game. In the same year, an arcade version was released by Sega in Japan for the Sega's system 16 and system E. It won the Japanese Gamest Award for Game of the Year the following year. 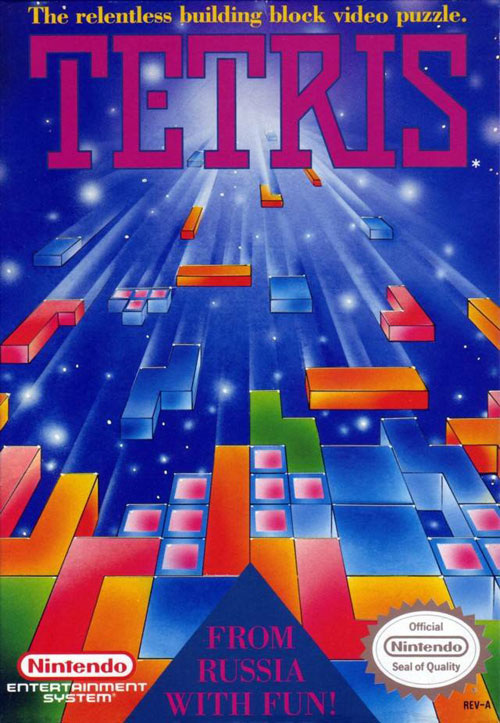 Tetris was also released in late 1988 by Bullet Proof Software (BPS) for several Japanese home computers as well as the MSX and the Family Computer in Japan. An unlicensed arcade version was released in Korea as well as an unlicensed Master System. In 1996, the rights to the game reverted from the Russian state to Pajitnov himself, who previously had made very little money from the game. In 1996, The Tetris Company was founded, claiming to hold copyright registrations for Tetris products in the U.S. and taking out trademark registrations for Tetris in almost every country in the world. They have licensed the brand to a number of companies, and the U.S. Court of International Trade and the U.S. Customs have at times issued seizure orders to preclude unlicensed Tetris-like games from being imported into the U.S., though bulletins circulated by the U.S. Copyright Office state that copyright does not apply to the rules of a game.